Finally! My own personal nation-wide nightmare is over! There is art on my walls!! I've always had a serious affinity for stuff on the walls. Which totally comes from my parents, who are huge art people (thanks MomandDad). My art is pretty random. A vast majority of it is pictures I've taken myself. Which is pretty lame, I know, but I like them and that's really all that matters, no? The rest is a mix of paintings my great grandmother created, impulse buys and gifts. 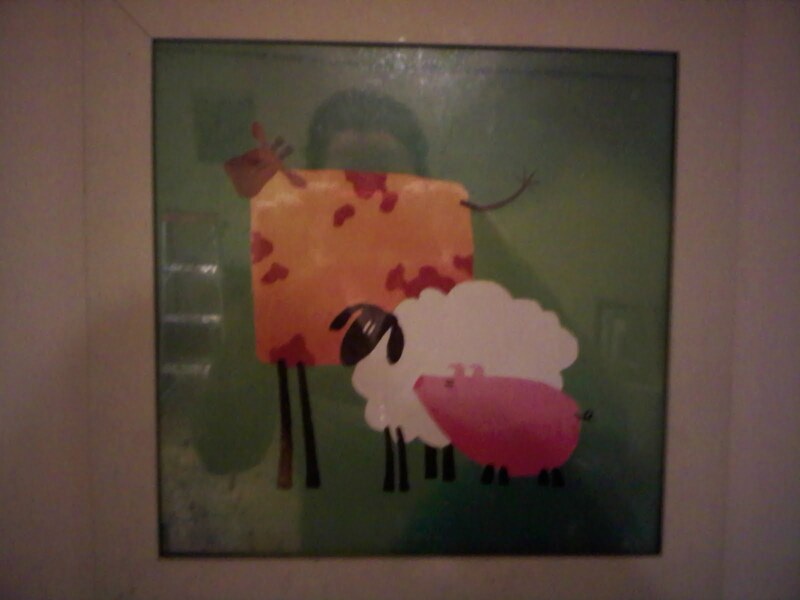 The one above was given to me by my first ever roommate in college - D. She bought it because she was a vegetarian and it was a reminder of all the animals I ate and how cute they were and how I probably shouldn't eat them because it made the house smell like bacon. Well, obviously that plan backfired. But these guys have hung in every kitchen I've lived in for the past eight years. It is originally from IKEA, and their frames are a-not actually glass and b- not really built to last. If you get too close to this sucker, its so filthy from eight years of bacon grease splashing around. But it makes me smile. Its one of the many pieces I've carried from place to place. I use to hang all my own art, mostly by just sticking pushpins in the wall, occasionally taking a hammer to the bad deal. But now this kid lives with me, and its made me super lazy. He wants to feel all strong and man-shaped. So I let him, which means sometimes things take a lot longer than I want. Empty walls are so terrible, especially when they're white. But art helps. I don't really feel like I live somewhere until there are things on the walls. Naturally my collection has grown extensively in 8 years - and amazingly its always fit into where I lived. Although, I guess it was good that Boyfriend did not come into the relationship with much in the way of art but his collection is growing as well. So we came to an unfortunate realization on Sunday. 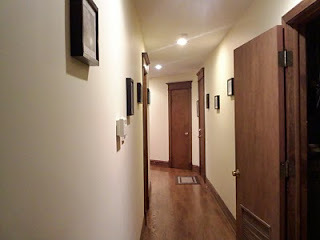 What happens when we don't have a nice, long convenient hallway/gallery to put stuff up?